Photographed at Catalina Island using a 28 - 85 mm zoom lens and a 15 second timed exposure. Avalon is currently going through a landscape front street remodel costing $2,000,000. 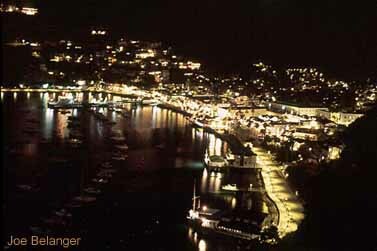 About Avalon: This is a quaint city, which is Catalina's main tourist draw. There are many great front street hotels and restaurants to choose from. It is a little pricey, but worth it. Very tropical-like setting. Photographed on my way home from Catalina Island using a 28 - 85 mm zoom lens. 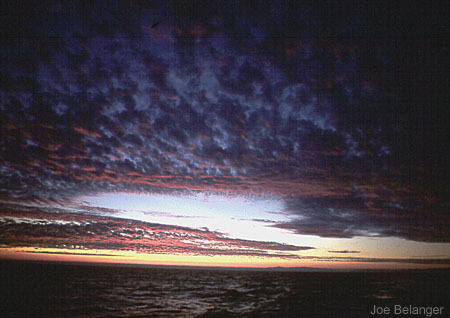 About this picture: One of the nice things about diving at Catalina during the fall is the excellent sunsets that sometimes occur. 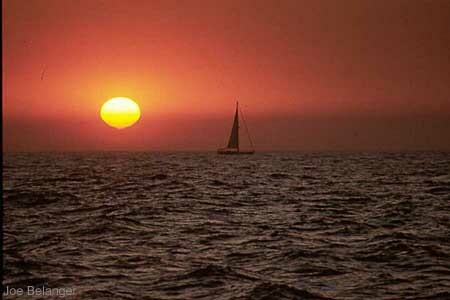 Here I saw a sail boat about to cross the setting sun and thought it would make a nice picture. Photographed at Catalina Island using a 28 - 85 mm zoom lens, Nikon N6006 set at 1/8 th shutter set at rear curtain sync., and an SB-24 fill flash. 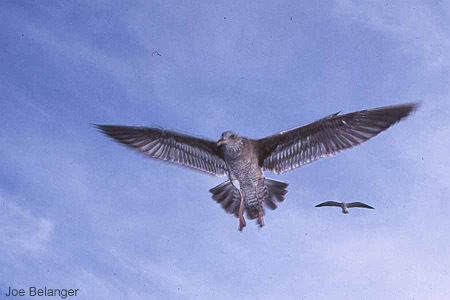 About this picture: Passengers threw crackers into the air and the seagulls would nab them up. While flying near the boat's stern, I shot pictures of them gliding. Using my N6006's rear curtain sync. flash feature, I was able to get a "motion" effect that really helps make the bird look like it is moving. Photographed coming home from Catalina Island during November. I used a 14 mm lens and ambient light. About this picture: It was a beautiful ride home.